I thought I'd blog on how you can pick up on the values of environment variables in VBA, as there's some useful stuff hidden away there. Note that we offer a full range of VBA training courses. An environment variable has the form Environ("VariableName"). Let's start with an example to do with the thing most precious to you: your good name, as held in the UserName environment variable. 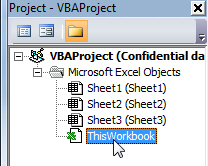 In VBA, double-click on ThisWorkbook for a workbook to attach code to its events. Choose to attach events to the workbook object. A greeting message ... ... followed by coloured cells. 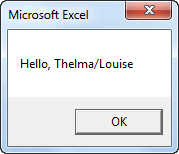 A typical use of the UserName environment variable would thus be to get a workbook to behave differently for different people. 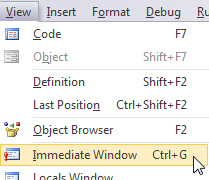 Do Until EnvironmentVariable = ""
Choose this menu option to show another window within VBA, to which you can write information using the Debug.Print statement. The last few environment variables on my machine. Environ("COMPUTERNAME") The name of your computer. Environ("USERDOMAIN") The domain you're logged on to (eg WISEOWL). Environ("USERPROFILE") The path to where your files are stored. 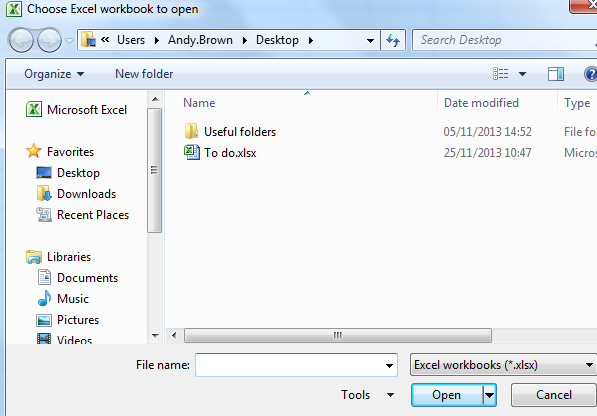 DesktopPath = Environ("UserProfile") & "\Desktop\"
fd.Title = "Choose Excel workbook to open"
You can open up any workbooks from my desktop! MyDocumentsPath = Environ("USERPROFILE") & "\Documents\"
This may be slightly different if you're still using Windows XP! I hope this has helped someone!